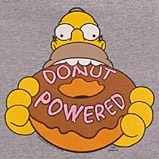 Science might soon serve up the ultimate sugary snack for drowsy cops and late-night truckers: a caffeinated doughnut. Molecular biologist Robert Bohannon, president of biotech company Onasco, has patented the power-packin' pastry concept, and is looking for partners to produce caffeine-laced doughnuts, bagels and other items, according to a report on LiveScience. To Bohannon, the idea's as simple and straightforward as dunking an old-fashioned buttermilk in a hot cuppa joe. "Some people get their caffeine buzz from soda, chocolate and other sources besides coffee," he said. "The Buzz Donut and the Buzzed Bagel lets them get the caffeine buzz by simply eating a delicious pastry item. I love donuts, but I'm not a donut junkie. However, I am a complete coffee junkie. They call the area between me and my morning coffee the "kill zone". I'm drooling at the idea of caffeinated donuts to go along with my coffee. The ability to discern good wine from bad, name the specific brand from a tiny sip and recommend a complementary cheese would seem to be about as human a skill as there is. In Japan, robots are doing it. Researchers at NEC System Technologies and Mie University have designed a robot that can taste — an electromechanical sommelier able to identify dozens of different wines, cheeses and hors d'oeuvres. Ladies and gentlemen, the future is here, and it thinks you taste like bacon. Update: We will have robot jam bands too! I have a feeling our future robot masters will toss some kickin' parties. James Bennett, left, a Netflix vice president, with the company’s chief executive, Reed Hastings, in a headquarters screening room. “If we knew how to do it, we’d have already done it,” said Reed Hastings, chief executive of Netflix, based in Los Gatos, Calif. The Airborne Laser, or ABL, is a Boeing 747 aircraft being equipped with a high-powered chemical laser to destroy ballistic missiles in their boost phase. Chicago-based Boeing Co. is the prime contactor on the effort. We don't need to reinvent the wheel or wait for sci-fi hydrogen fuel cells. The technologies we need for a stronger, more energy independent America are already here. The only thing we have a shortage of now are leaders with the imagination and will to move the country onto a geo-green path. As late as September 4, 2001, Richard Clarke asserted that the government had not yet made up its mind how to answer the question: "Is al Qaeda a big deal?" A week later came the answer. According to James Fallows, eventually we'll get the leaders we need. But what's along the path between now and then? The story we will tell Americans begins in 2001, and it has three chapters. For public use we'll refer to them by the names of the respective administrations. But for our own purposes it will be clearer to think of the chapter titles as "Cocking the Gun," "Pulling the Trigger," and "Bleeding." The two-party system had been in trouble for decades. It was rigid, polarizing, and unrepresentative. Eight years of failure from two administrations have finally blown apart the tired duopoly. The hopes of our nation are bleeding away along with our few remaining economic resources. Google seems to be really on top of indexing MemeStreams, but this is still worth implementing. I'll look at it in some detail and put it into plans moving forward. There's a new NetNewsWire. It's been "streamlined", includes a tabbed browser, automatically downloads podcasts, supports "smart lists" like iTunes, and more. Best of all, upgrades are free. I've been using NNW 2.0 for awhile now. Even most of the betas were pretty reliable. The biggest win, aside from the new features, is the speed increase. Zooming around browsing articles is significantly faster. The memory usage could be a little bit better, but that's the tradeoff. I have not used it myself, but there is also now support for syncing subscriptions between multiple machines using both .Mac and a standard FTP server.
] How do you talk to someone without opening your mouth? Very cool. Even in the limited fashion described in this article, this technology could be used as a method to control wearable computers. The most intriguing, and potentially most important, dimension of the deal for the company is that it is IBM's China card. The new Lenovo, folding in the IBM personal computer business, will be China's fifth-largest company. IBM is eager to help China with its industrial policy of moving up the economic ladder, by building the high-technology engine rooms to power modern corporations and government institutions with IBM services and software. IBM is placing 10,000 of its employees, its brand for five years and some of its prestige in Lenovo's hands. There is a lot more at stake than the cash. Today, there are two ways to create long-term value for information technology customers and shareholders. "Invest heavily in R&D and be the high-value innovation provider for enterprises, or differentiate by leveraging vast economies of scale, high volumes and price." IBM is choosing the first path, and has decided that the PC business is inevitably on the second path. Yes, the technology present in Real Genius exists in real life now. Only its being used to shoot down missiles, not vaporize human targets.